Divide students into small groups of 2-3 and provide each with a small pile of cards from a full deck of cards (be sure they don’t have duplicate numbers…swap out if they do). Ask students to define the term “hierarchy” and to demonstrate what it means with their cards. Ask students to share their definition along with how they demonstrated it with their cards. Most students get that it’s an order (high to low or vice versa) and most of my students associated the term with “royalty” and historical examples. Introduce students to Abraham Maslow and his Hierarchy of Needs by having them read an article from Common Lit titled “Maslow’s Hierarchy of Needs” and using the information to complete a diagram and some questions (see below). The next day I recap the theory by showing students this YouTube Video “Maslow’s Hierarchy of Needs”. We discuss what each level means in further detail and share a variety of examples. I also show them a YouTube clip from the movie UP to illustrate how the needs are met throughout the story with various characters. There are a lot of other Disney movie examples if you don’t want to use UP….just search on YouTube. I follow that with a Quizizz review to see if they understand the theory and can apply it to various examples. Students find this a bit more difficult than they anticipated. 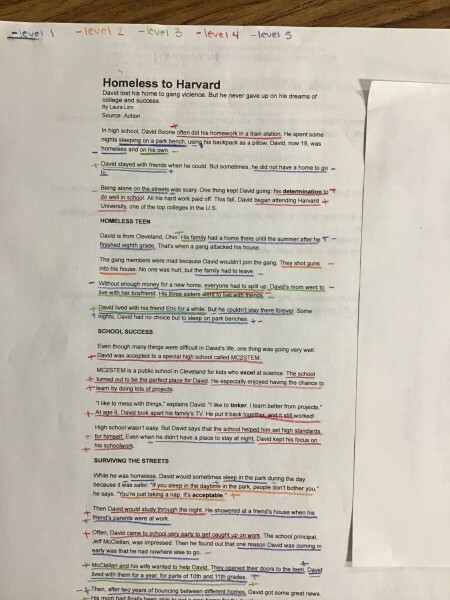 Next, I share an non-fiction, true story from Scholastic titled “Homeless to Harvard” about a young man who really did go from homeless to Harvard. I chose this avenue instead of the movie about Liz Murray for many of reasons. 1. This was more current, 2. The article was the perfect length and not too difficult for my students to read and comprehend, 3. The article was a perfect way for me to get my students to annotate the text and really dive into how Maslow’s theory was illustrated and where needs were represented as met and unfulfilled and 4. I don’t always want to use a full length movie as it chews up a lot of days and when periods are only 43 minutes long, that’s a lot. 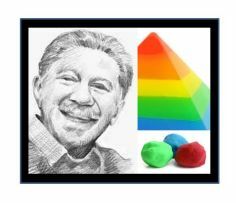 The first thing students have to do is grab 5 different colors of colored pencils and create a key of which color will represent each of the levels of Maslow’s Hierarchy. As students read the article they are to annotate it by underlining the example by need it meets or goes unmet. If the example illustrates the need being met, students place a “+” sign beside it in the same color they used to underline it. If the example illustrates a need that was unfulfilled, then they place a “-” beside it in the same color they used to underline it. After students have finished annotating their story, they grab some play-doh and complete the processing activity. This can be done as an individual or partner activity…your call. Students have to create an example of a need being met for each level from the story from play-doh. Students then have to explain it using cited/quoted text evidence from the story to support their creation. Because this is a tech based project in Google Slides, students have to take a photo of their creation using their iPad camera and then insert it into the presentation. Note: This project could be done without technology but you would have to print out the templates for students to set their creations on and hand write their explanations. This could then be set up as a “Gallery Walk”. 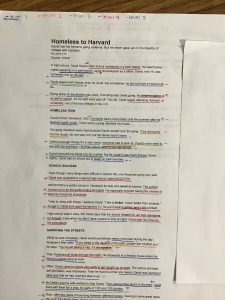 As an extension, I give my students some examples of unfulfilled needs that did occur or could have occurred in the story (but aren’t cited) and students have to research local community resources that David and his family could have turned to for help in meeting those needs if they lived in our local area. I like to show students that there is help available and many times it’s free or low cost….all they have to do is ask or let someone know what’s going on. This also gives me the opportunity to share about the services our school offers. If you want to give a short quiz regarding Maslow’s theory, I’ve included one below.